Archibald Hunley, subject of this sketch, is well known over Clay county, as well as are very few others. He was born in Clay City where Crackel & Sons' garage is now located, December 23, 1874. He spent his early life on the farm near Clay City. 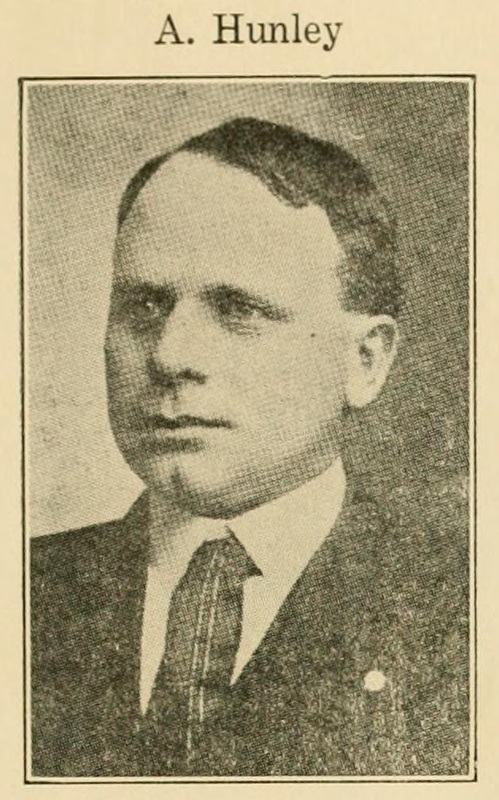 In 1901 he was appointed guard at the Southern Illinois Penitentiary where he served under Governor Richard Yates a few months over four years. Returning to Clay City and again entering the farming game in 1905. He pursued this vocation until the year of 1917 when he purchased the J. A. Rodgers grocery store, where he — let us pause right here to state that now and hereinafter when we refer to his grocery business it's in his name only, because his wife, Lil, as she is commonly known, is the whole thing in this grocery business and her picture should have appeared beside his but she would not consent. Now, we back up to say he is still conducting a thriving grocery and meat market, in the old building occupied in the 90s by the post office. Arch is more interested in his farms and stock raising; this is why he leaves the store business entirely to Mrs. Hunley. He takes care of it at times while she goes to her meals a few steps away, providing she is absent but a minute or two — he'll leave. He would rather face a zero blizard and go to his slaughter house and dress a hog than to count a dozen of eggs. Mr. Hunley has served his township as supervisor five two-year terms and was again elected last spring for his sixth. However, politics betrayed him back several years ago defeating him once in the primary and once in the general election for sheriff. Since then the office has been tendered him by his party with almost positive assurance of his election and he said NO. There is no better hearted man than Arch. His kindness and the favors he has extended to the needy, his sympathetic disposition toward those who are less fortunate than he has made him many, many friends, not only around among his home people but all over the county and elsewhere where he is known. But "Lil" runs the grocery store.